Since this is Aquaman's 75th year, every so often I am going to post what I call All-Time Favorite Aquaman Moments. It can be a cover, a panel, a series of panels, or, like in this case, a series of pages. 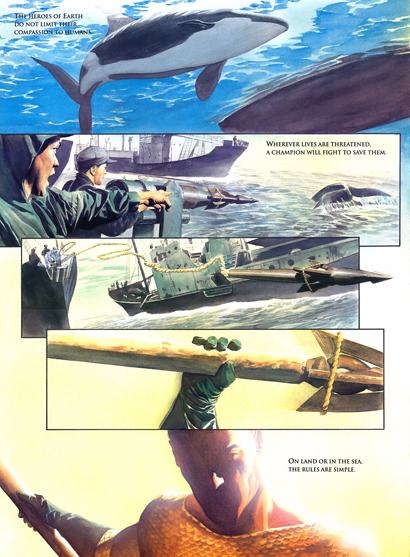 This sequence from Paul Dini and Alex Ross' Justice League: Liberty and Justice remains a classic to me, and this full-page shot of the Sea King is still my single favorite Aquaman image of all time. Aquaman as the Bird of Prey from Star Trek IV. It's a surefire classic. Great moment, realistically rendered. 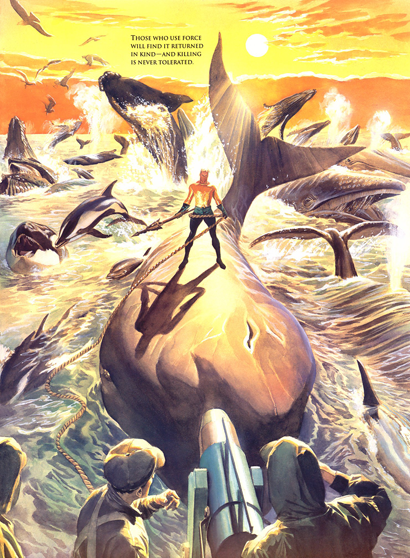 Would love to see Aquaman take on the deep sea trawling that decimates the numbers of dolphins and turtles.